And let us fall down upon our knees and thank the invisible Bubble Blower that poets are still born unto Life. For a great poet is a chalice that holds the Presence. 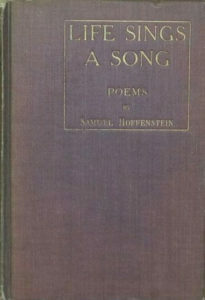 “Life Sings a Song,” a small book of poems by Samuel HofFenstein; contains the imperishable beauty of a supreme singer. He is a poet laureled before his birth, as exquisite and as rare and as delicate in his prose as he is in his lyrics. He does not “strike the note of Modernity.” He strikes the note of Eternity. He is not “up to date.” He is as dateless, as uncalendared, as Love and Death, as moonlight and war, as music and flowers, as gods and Desire — which are the themes of the poems. The melancholia of mankind is here. Death — beautiful, magical, singing, bountiful Death — haunts every page. These are the Songs of a tired child — a child who has lived on Olympus with Blake and Swinburne and Chopin. There is no rush and roar in these pages, and the smug hopesmiths of the street will find nothing here for them. Rather the rainbow changes into a skyey waterfall as vast as the song of Israfel; or the slow immortal tread of Proserpina; or the music of many lutes in far forests. What purity of vision and heart in this volume of poems! Purity! An almost obsolescent word. The purity of wild, coast-free waters, the purity of starlight, the purity of Death. Samuel Hoffenstein knows that supreme things— Purity – that no puritan shall ever understand; but that can be apprehended only by the castigated singer, the poet flagellated by life. It is Life Singing to Death, singing with the simplicity, the sincerity, the. clarity of elemental beings. Thanks for this beautiful, mournful music. Thanks for this exquisite personal revelation of a spirit who has the sacred sickness of Shelley, Chopin, Poe and Francis Thompson. The Tragic Muse is still alive in smug, fat, snug America. There is hope !